Created using the Folktek Mescaline system and Ciat Lonbarde instruments (Plumbutter, Sidrax and Cocoquantus). Eventide pedals for effects (Space and Pitch Factor). No computers were used. Heavy stuff, great to hear your music again Adam. Lil bit creepy but in a good way. I'm jealous of your Ciat-Lonbarde gear!! what an amazing lot of gear there! great sounds! Thanks. The bends are coming from the Mescaline. Thanks mate. Glad to see you're back too Pat. Always enjoy hearing your tunes also. Creepily good! And yes, I had been eyeing off CL gear for years and finally accumulated the perfect CL trio over the last couple of years. Such a unique sound world to delve into. Thanks Jim! There will definitely be contrast Back to Buchla next week though. [quote=I_See_Drones]UUuu especially nice pitch bends in the middle[/quote] Thanks. The bends are coming from the Mescaline. [quote=Lyons]Heavy stuff, great to hear your music again Adam. [/quote] Thanks mate. Glad to see you're back too Pat. Always enjoy hearing your tunes also. [quote=Nestrogen]Neato! [/quote]\ Cheers! [quote=Kris Keyser]Lil bit creepy but in a good way. I'm jealous of your Ciat-Lonbarde gear!! [/quote] Creepily good! ;) And yes, I had been eyeing off CL gear for years and finally accumulated the perfect CL trio over the last couple of years. Such a unique sound world to delve into. [quote=Jim Wood]Quite the contrast to last week's post. Deep, heavy and neato! ::)[/quote] Thanks Jim! There will definitely be contrast :D Back to Buchla next week though. [quote=kaedo sevaada]what an amazing lot of gear there! great sounds! [/quote] Thanks! [quote=purelygrey]Trippy :O I love it. It'd be right at home in some surreal game[/quote] Awesome. Cheers! These instruments have made it into the last few films I worked on actually. Obviously in the more disturbing and unsettling scenes :D [quote=Tone Matrix]far out and mesmerizing performance :o[/quote] Thanks man! Ha! I want to play this game! To me this piece evokes the sound is a solo Tring player with an extended range of expression accompanying an emergency siren. The siren is eventually seduced by the string player and together they join in sonic matrimony to create a glorious beat baby. As a side note I think all of your mescalin work demonstrates a use of space I don't often hear in your music. Like a soda water for the ear canal. [quote=purelygrey]Trippy :O I love it. 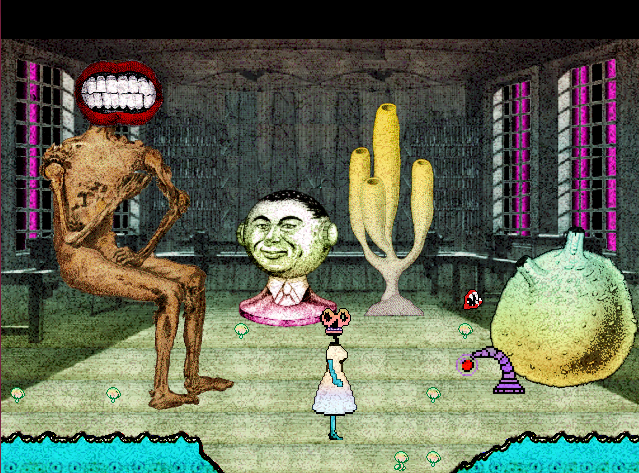 It'd be right at home in some surreal game [img]http://www.anatomiederform.com/blog/wp-content/gallery/gingiva/tumblr_n47o2tLm521si9zkno9_1280.png[/img][/quote] Ha! I want to play this game! To me this piece evokes the sound is a solo Tring player with an extended range of expression accompanying an emergency siren. The siren is eventually seduced by the string player and together they join in sonic matrimony to create a glorious beat baby. As a side note I think all of your mescalin work demonstrates a use of space I don't often hear in your music. Like a soda water for the ear canal. Well done. Oh, yeah! This is fabulous - love the pitch bent voices and resonant tones that sweep and drift over this. Lovely, lovely work.